LBN 2018 is now up and running, both the lists are complete. We have some new venues for you to visit, some that have returned after a few year absence and we have some original favourites. 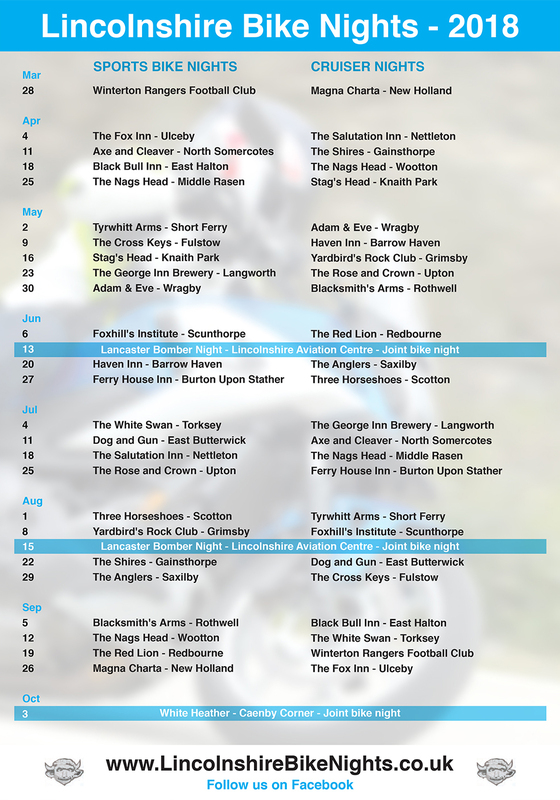 Remember all the venues welcome bikers all year round not just on the bike nights. Please have a ride out or have a meet there, to help support the venues that support the LBN. There are also two Lancaster Bomber Bike Nights this year again at the East Kirkby Aviation Centre. For those that like boats and bikes the Dog and Gun with it's own Brewery and the Ferry House will both have full tides on the River Trent during their LBN 2018. We hope that you enjoy the venues for the 2018 and we thank them all for their support as without them we could not hold the Lincolnshire Bike Nights. Last but not least, our thanks to you the bikers, for supporting the events!